While i can't comment on the CanJam section as didn't have time to listen, their home audio room was well worth the time to sit and listen! Smooth, clean, relaxed yet very musically engaging. My wife and Muse Heather commented how gorgeous the Sonus Faber Olympica Three Wenge floorstanding speakers looked, with fine Italian craftsmanship and all. Sonus Faber speakers would look great within the finest of home decors, including ours (right Heather). 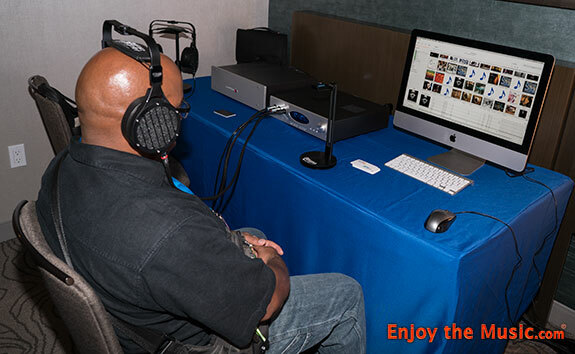 That they also just so happen to produce true reference quality sound is icing on the cake! Enjoy the Music! 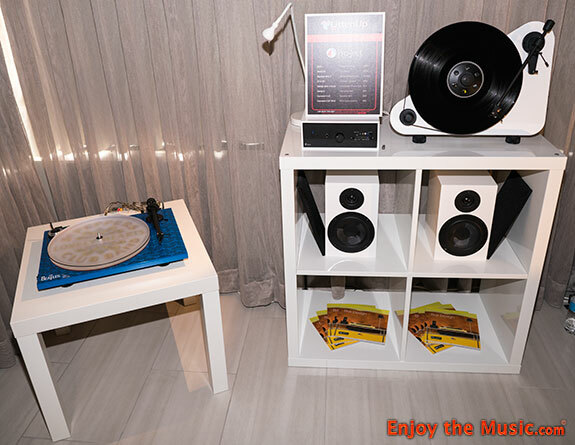 BTW, come see Enjoy the Music.com's World Premiere review of Pro-Ject's Debut Carbon RecordMaster HiRes turntable here. 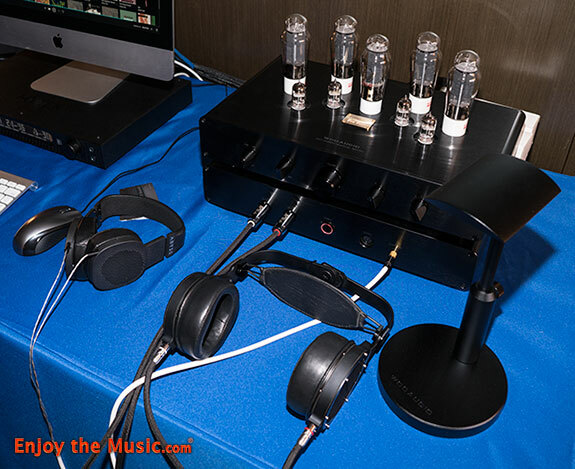 Abyss came to RMAF 2017 and CanJam ready to deliver heroic sounds with their AB-1266 Phi complete ($7495) planar headphones mated with a Mytek Manhattan II DAC ($5995), Woo Audio WA-33 Elite ($14,999), KR Audio HP tubes ($3500), JPS Labs Super Aluminata interconnects and AC cables ($24,000). 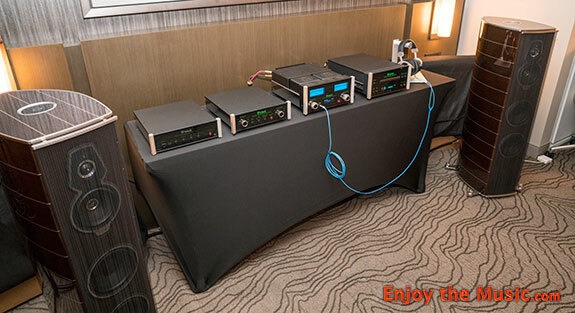 ANother system had their AB-1266 Phi Lite ($4495) cans with LampizatOr Amber 2 DAC ($2495), Rogue Audio RH-5 headphone amp ($2495), JPS Labs Superconductor V interconnect ($899), and JPS Kaptovator Lite AC cables ($1195). 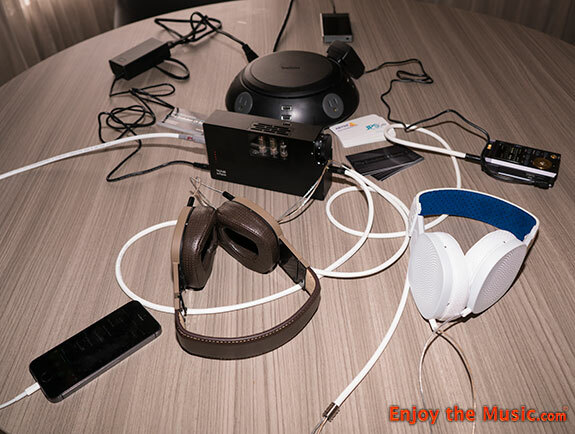 You could also hear the AB-1266 Phi Lite with Diana headphones, Sony HAP-Z1ES player, XIAUDIO Formula S headphone amp ($3495), JPS Labs Superconductor V interconnects ($899), and JPS Kaptovator Lite AC cables ($1299). The new Abyss Diana ($2999) is available in three colors, Black Onyx, Arctic White, and Coffee. This was just for the home audio guys per se. Within the CanJam section were the Mytek Brooklyn DAC ($1995), XIAUDIO Formula S headphone amp ($3499), Abyss AB-1266 Phi Lite ($4495) with upgraded JPS Labs Superconductor HP cable ($2599) or a system with the new Abyss Diana and Lotoo PAW Gold portable player ($2399). Needles to say it was impossible to hear each and every iteration of headphone and source components, yet overall i always come away very impressed with Abyss headphones with JPS Labs cables and assorted gear. Fast, clean, very good deep bass and of course silky-smooth mids and highs as you expect from top-quality Abyss cans. Check out our review of the Abyss AB-1266 planar magnetic headphones by JPS Labs at this link. 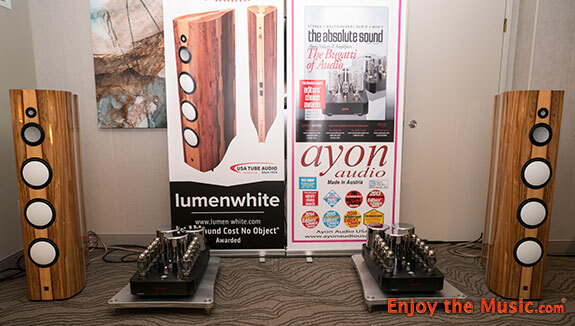 Ayon Audio and Lumenwhite keep getting Best Of Sound at shows from not just us, but from other mags too and so once again they don't disappoint. 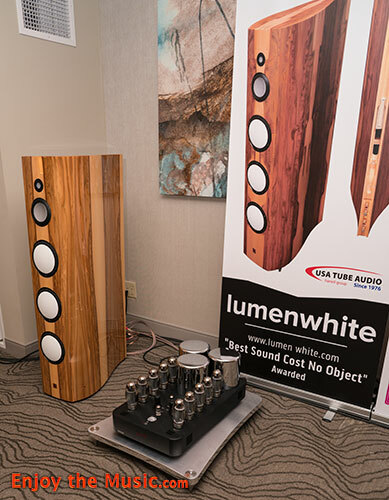 This year at RMAF they had the little 'Baby Brother' Lumenwhite Kyara loudspeakers being driven by the new Ayon Orthos II Gen 4 monoblock amps. Lumenwhite Kyara loudspeakers ($49,000) feature Accuton drivers specially made for Lumenwhite to their specs. Instrument grade cabinets are obvious just from looking at the fine craftsmanship, with the finish seen here being French Nut. Ayon Orthos II Gen 4 monoblock amplifiers ($27,000) operate in triode to produce 250 Watts per mono amp. Charlie Harrison of Ayon also brought with him the S-10 ($10,000) vacuum tube streamer, pre-amplifier, MQA, DSD, Tidal, Roon compatible unit. Yes sir, it sings, it dances, it handles playing your fave tunes! 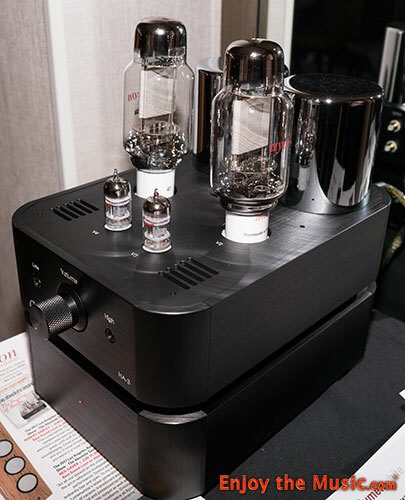 Ayon's Spheris III Gen 4 ($33,000) vacuum tube pre-amp has a separate vacuum tube power supply to ensure any noise from the power supply does not reach the critical analog signal. Ayon's CD-35 ($12,000) vacuum tube DAC, pre-amplifier and handles SACD. Lastly, the BBS Amp Stands ($4000) are made with aircraft grade aluminum, have a special honey comb vibration control, are are available in black plus four other anodized colors. The frame structure is solid stainless steel and made within the USA. Ayon Audio's HA-3 ($3595) was developed for headphone lovers and take advantage of single-ended triode tubes for output. Specially selected in-house AA45 Mesh super triodes are used in combination with special super-permalloy wound output transformers. A sequenced soft-start power up helps to extend tube life, while the signal is kept as pure as possible via an ultra short signal path. 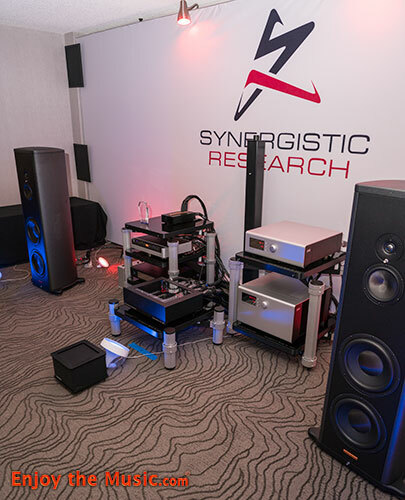 Synergistic Research came to RMAF 2017 fully armed are ready with some of the best of the best! 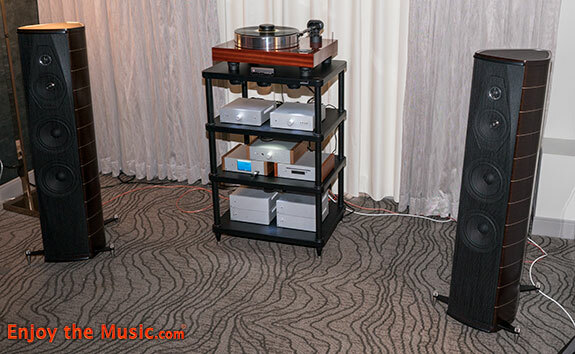 Berkeley Alpha DAC Reference series 2 MQA w/ Alpha USB Module ($21,395), Aurender N10 Music Server ($8000), Soulution 520 and Soulution 511 Stereo plus a pair of always-incredible Magico S5 Mkll loudspeakers (38,000/pr). Power conditioning was via Synergistic Research's PowerCell 12 UEF SE ($6495), acoustic room treatment were extensively by Synergistic and included their Black Box, Atmosphere XU w/ ATM, UEF Acoustic Panels, HFT, HFT 2.0, HFT X, Vibratron, and MiG 2.0. Racks and shelving were also Synergistic Research with the Tranquility Base XL UEF. 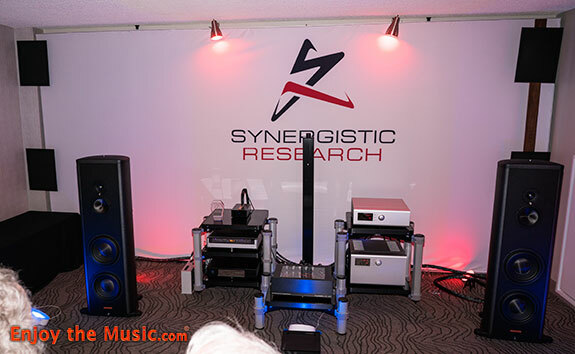 Careful attention is also paid to grounding with the use of the Synergistic Research Active Ground Block SE and High Definition Ground Cables ($2995 and $395 respectively). Naturally all cables were by Synergistic Research from their SR25 Limited Edition AC ($20,00) to the Ethernet Active SE ($550). As you can guess, the sound was smooth, clear, and all-day listenable. Heather and i truly enjoyed our time in the Synergistic Research room. Enjoy the Music.com reviewer Rick Becker loves the Synergistic Research PowerCell 8 UEF SE, Atmosphere Level 2/3 Power Cords (reviewed here). McIntosh has been on a roll announcing new product after new product. 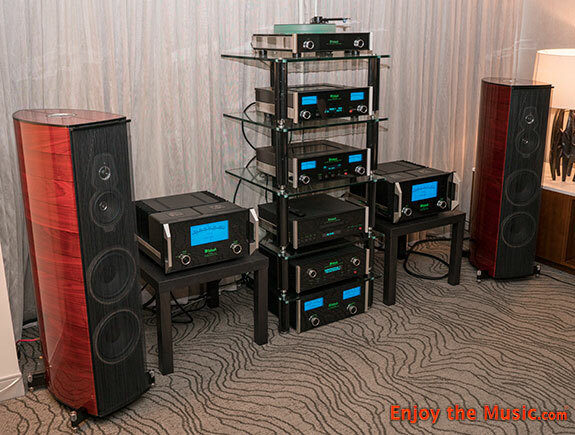 During RMAF they were showcasing their new MA252 that mates a solid-state amplification section with tube preamp. It also has headphone amp too! The solid-state amplifier produces 100Wpc stereo in Class AB (160Wpc into 4 Ohms). For inputs, there's balanced XLR, two sets of unbalanced RCA. 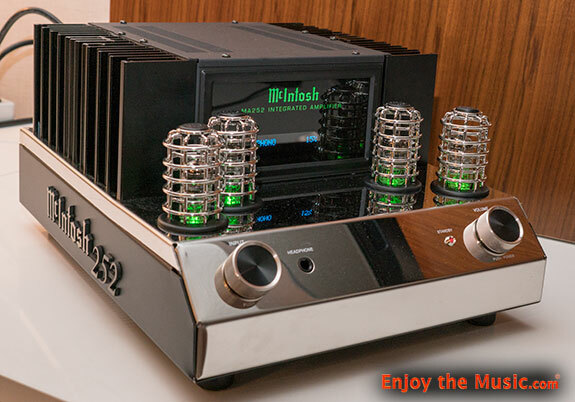 With high drive headphone amp and MM phono stage, McIntosh is looking at this new entry-level integrated amplifier to fill the needs or entry-level McIntosh users. BTW, there's also an OLED display for functions such as bass and treble control. Enjoy the Music.com has a special World Premiere review of Sonus Faber's Amati Tradition floorstanding loudspeaker.